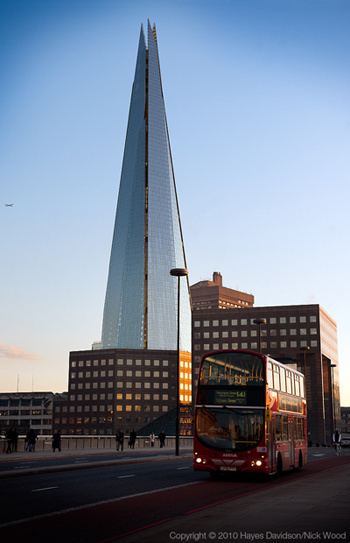 Since the core topped out at 235m last month, the Shard's growth has slowed. 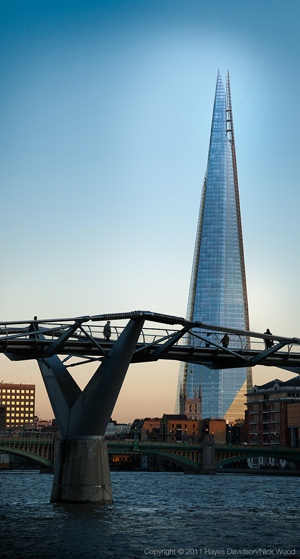 While we wait for the glazing to catch up with the concrete, here's a tantalising glimpse of how it'll look when finished next year, courtesy of photographer Nick Wood and design agency Hayes Davidson (who've previously given us the London Skyline Designer). 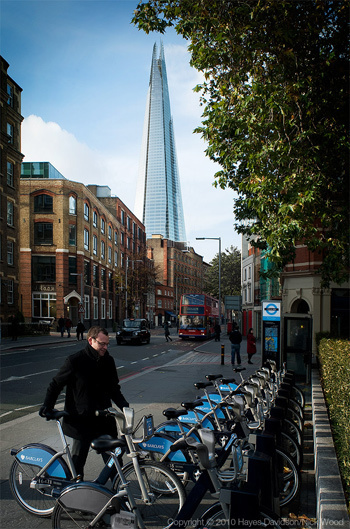 The project, Future London, sprang from the question: "Where and how might Londoners photograph [the Shard] in the future to capture its form, beauty, juxtaposition with the historic, as well as its relationship with everyday London?". Wood set about taking photographs of the building from various aspects in late 2010 (probably crossing paths with Londonist as we were doing the same thing), and after selecting the best ones, the building was digitally completed using 3D modelling software. Coincidentally, we learned about this project on the same day that the Evening Standard published an article questioning the building's impact on London. 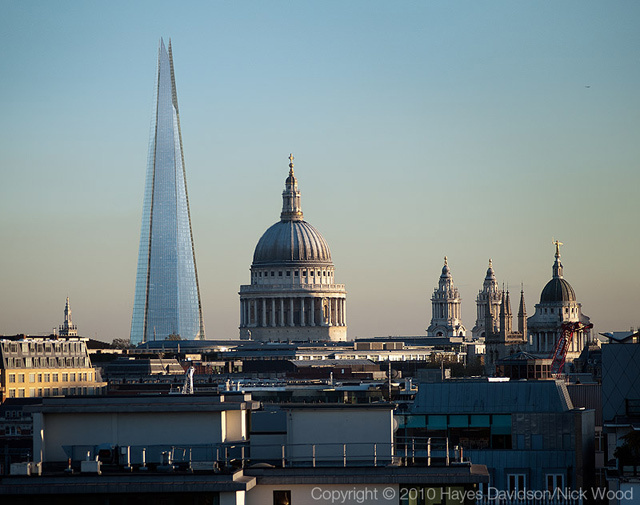 In a glib piece headlined "Not quite what Wren had in mind", the newspaper ran unchallenged comments from an English Heritage spokesperson, who deplored the building as a "spike through the heart of London" and criticised its effect on St Paul's. 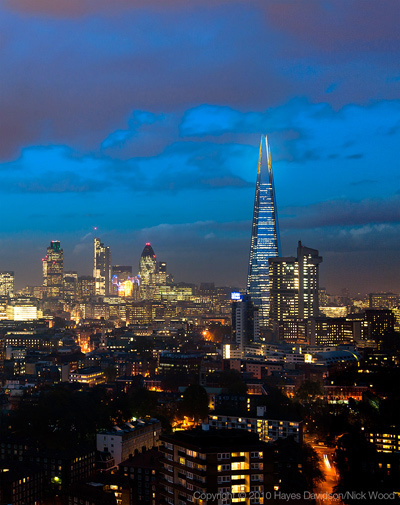 The piece carried a photograph of the view from Parliament Hill, showing the Shard's core growing behind the cathedral, although it neglected to mention that the shot was taken with a fairly powerful zoom lens. Londonist can hardly suggest we're impartial on this matter — we've long been fans of the building. 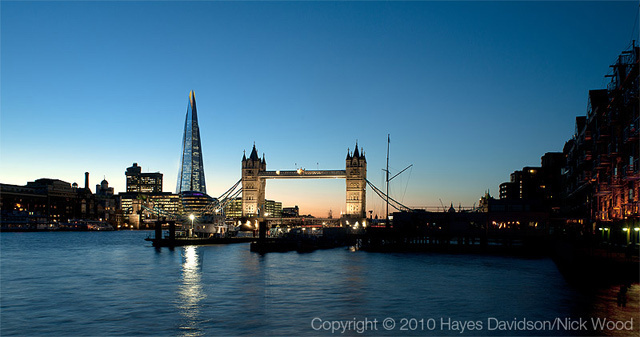 But to judge from the reaction to our posts on its construction, many Londoners have taken the Shard to heart. It's probably the most popular new architectural project since the Gherkin, and its elegant form lends an aesthetically interesting contrast to the city's older parts, rather than "spoiling" them. Were the Standard around in the 17th century, it would presumably be printing jeremiads from contemporary heritage buffs lamenting how St Paul's ruins the surrounding views. So, just what would Wren think? Short of a Bill 'n Ted-style excellent adventure, there's little chance of finding out, but we imagine that he'd be impressed to see how well his masterpiece has fared, and as a forward-thinking architect, might appreciate how London has honoured his work without letting its future be dictated by the past. All photographs copyright Hayes Davidson / Nick Wood.